It was a lovely addition to my home at ChristmasVery good price! I would definitely recommend this item to my friends and family for purchasing. Winding and twisting around your banister, entryway, beams or anywhere else, this garland add holiday festivity wherever it is places. The beautiful red poinsettia blooms sit on top of this lush green garland. I ordered this for my fireplace mantel to have for next Christmas. I am very disappointed. It is so cheapy constructed -- and honestly looks like I purchased it from the Dollar store. I have ordered clothes from Over Stock before and was very pleased. There is absolutely No Way I should have paid $**** for this. Honestly, I wouldn't buy this item for $5.00. I should have definitely mailed it back!! I absolutely love this on my dining room table. It looks festive and ready for the holidays. The red in the poinsettias and berries stand-up and out compared to my table and the green from the other parts of the garland. I love this purchase! Very Pleased with the product as ordered. It looks nice on my credenza. This garland was beautiful. I received many compliments about it. 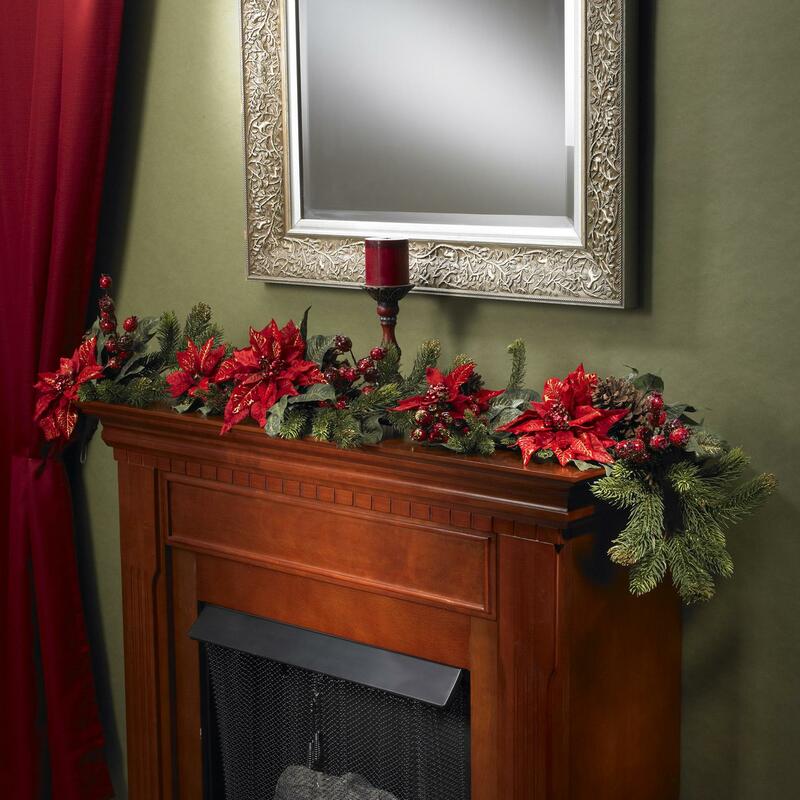 This is a beautiful piece of Christmas decor that works perfectly in my home and over my fireplace. Its very sturdy and looks real. Its a wonderful addition to the holiday spirit. This is beautiful and exactly what I was looking for to go on my kitchen table. I love Christmas, and all the decorations and this made my house look so Christmasy. This is absolutely beautiful above my fireplace. I have received compliments on it. I like this garland, it's sturdy and very pretty on a mantle. The only reason I gave it three stars is bc it's a little expensive! Very pretty and durable. Will be using on my doorway at xmas. Would recommend to others. Beautiful !! Perfect addition to our Christmas decorations. Seems nice enough to last for years ! Beautiful and feel that they did a pretty good job. It looked somewhat real. I would buy again. very Pretty made very well ! !